I’d like to introduce a new interview series to Mind & Motion this week. In this series I will interview women from all walks of life about their movement practice and how it has effected them. I find how women connect with their body through movement, exercise and somatic practices very inspiring. I’m very excited! Since then my mom has become an equestrian and a lover of danger! Ha! 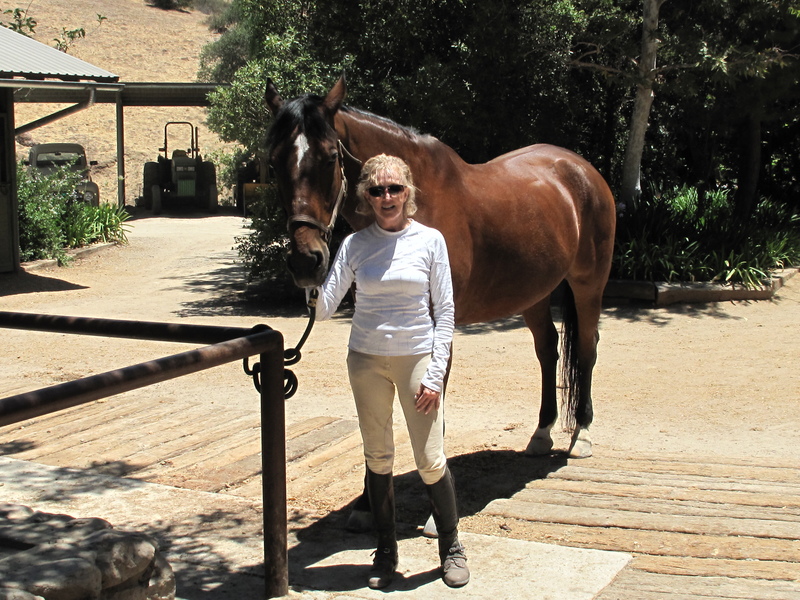 Please continue to read about her exciting journey into all things horses at the ripened age of 58. M & M: What do you do for exercise? Being retired I now have more time for exercise. I ride my horse 4-5 days a week and take a Pilates session one day a week. I was also taking a tennis lesson, but I have had some problems with my knee, so that is on hold for the moment. Have you always considered yourself a “fit” person? I guess in a way I have but not consciously. I certainly exercise more now than when I was young. I was probably in my late 30s to early 40s before I realized how important it was to my well being. What does being fit mean to you? Being fit means having your body perform at its best. That can vary from person to person. It also means testing your physical strength to see if it is at its upmost. 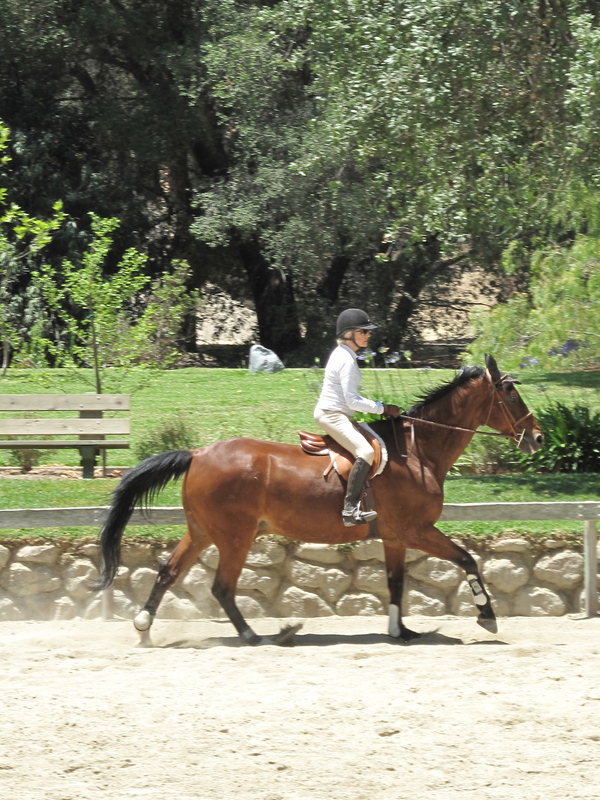 At what age did you become an equestrian? I was 58 before I ever took a riding class. I am now 72. If I had started younger I would be a far better rider than I am, but considering half of my high school class is not walking around any more, I am proud of where I am. 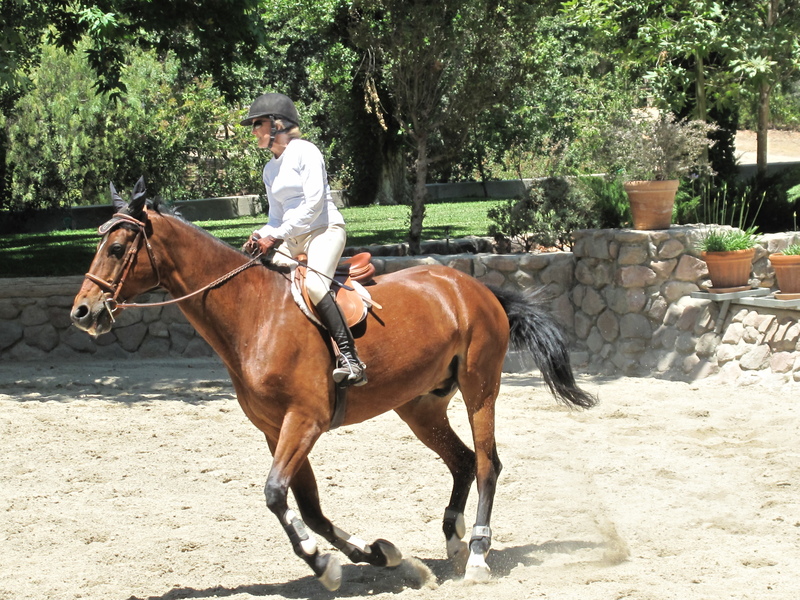 Was it daunting to start riding horses at such a late age? It was terribly daunting to start such a tough and dangerous sport so late. As a child I was always afraid of not doing well or getting hurt doing something. At age 7 I had an opportunity to take an elephant ride. I waited in line with my parents and when I was ready to go up the ladder to get on, I said I can’t and didn’t do it. I have always regretted that. I think it has taken courage to do this now. How did the other women (and girls) at the barn perceive you then, what about now? I don’t think anybody paid any attention to me when I started and it took a couple of years before I had time to devote much attention to riding. The important thing is I haven’t stopped. Have I had falls? Absolutely! Is it risky? You bet….but I feel so good about myself when I do well. That feeling carries over into other parts of my life. It is so nice to communicate with girls and women of all ages and we all relate to one another through horses. They don’t think of me as “this old lady”. What is so gratifying about your sport? I think the fact that you are always slowly improving. Working with a horse is so different than other forms of exercise because you are dealing with a large animal who can have a mind of his own! You constantly have to be aware of him, your surroundings, the weather, everything. This keeps all your senses working and your balance and muscles ready for anything. 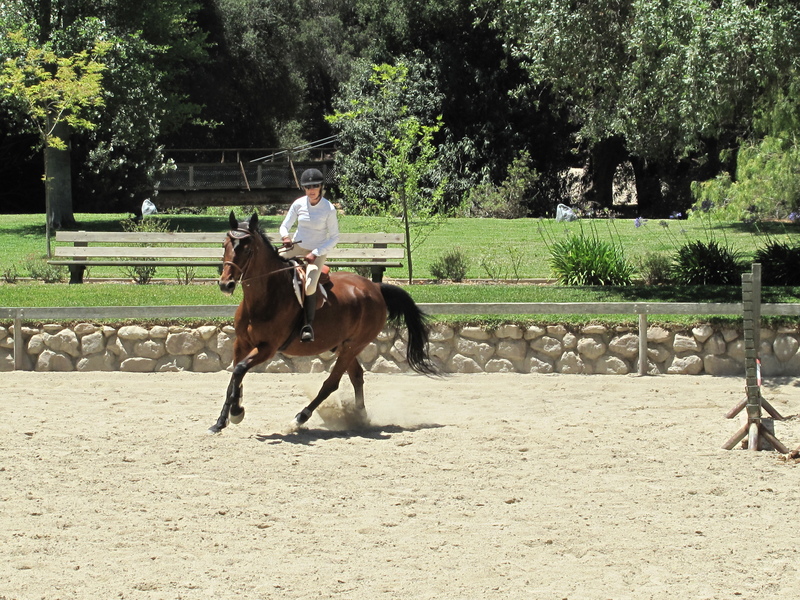 I had a very gratifying moment today when I was able to canter Bolero (who is very fast & big) without stirrups. The only thing holding you on are your legs. I achieved something today. Has horse riding changed your self image, if so, how? I have learned I can start a whole new area of my life and develop parts of myself yet unexplored. I think it has helped me be more positive about achieving things that seem very difficult. I am proud of what I am doing and only compete with myself. I am also my worst critic. How did you stay in shape prior to horse back? I was a dancer (not particularly good, but I enjoyed it). Then I did aerobics for many years especially during the Jane Fonda period. Even when I was working so much and traveling, I would try and find a place to take an aerobics class. I love the feeling of tired muscles. I sleep better when I am physically tired. How has keeping a weekly movement practice (with any form of exercise) effected your life? has it effected it for the better? Routine is important for me. I am not one who can exercise on her own. I need other people in a class, the right atmosphere and mind set and total focus on what I am doing. This has made me disciplined in other parts of my life and I think that is good. I hope I will be doing some form of structured exercise until my dying day. My goal is so get better at riding and have as much fun out of life that I can!!! It burns when it’s working!? I couldn't find the grandpa and kid. boo. So do remember the old commercial for aftershave depicting a grandpa and his grandson? The grandfather is standing in the bathroom with his 10 year old grandson teaching him how to shave. The young child watches and mirrors his elderly grandfather with curiosity. Post shaving the Grandpa, takes out his aftershave and rubs it onto his face exclaiming, “It burns when it’s working!! !” (Now repeat this is in a Jewish NY accent – it’s funnier) The child is somewhat horrified. This commercial always made me laugh. The grandpa is funny- he takes his shaving very seriously. The child is innocent, taking it all in. But it also leads to an interesting question – does burning mean that it’s working? Most of the time in our workout we are trying to connect to something visceral in the experience. Sometimes that comes in a feeling of the burn. A burning sensation is due to a build-up of lactic acid during a short strenuous exercise. It is also thought that muscle burning, particularly post-exercise is due to microscopic tears in the muscle which are then repaired and strengthened (hence your muscles become larger and stronger). I believe that the feelings of muscle burn can be charted on a bell curve. Those who are low tone (don’t have much muscle tissue) won’t feel their muscles working as much. This is primarily due to the fact that they don’t have a lot of tissue. Those at the top of the curve have enough tone and tissue to actually feel their muscles working- hence, feeling the burn. However, because our body is so smart and adaptable you start heading down the other side of the curve. At the other end of the curve, the muscles have strengthened, adapted to a specific exercise and burning feelings will diminish (this is why we would increase the weight if necessary). Depending on where you are on the curve for that particular muscles group in the context of an exercise will determine how you feel your muscles. Basing exercise effectiveness on a feeling is tricky. A burning feeling can be good if you are keeping good form and are focusing on how you are moving the joint. Burning is not necessarily helpful if you are so fatigued that your form is compromised. At that point you are teaching the body a negative pattern. You may feel the burn which could be great. You could also be performing a perfectly effective exercise without much sensation. The focus should be on how you are performing the movement, the burning is a result. Get it? Exercise effectiveness should be based on the body, how it’s reacting to varying forces and the intent of the exercise. Remember the feelings are a result, not the intention. The intention is to move through space. The more you understand gravity, weight and counterbalancing forces, the more you will understand how your muscles should respond. Remember, you may or may not feel the burn.